I didn’t intend on being away from the blog for so long…is it too late to wish you a Happy New Year? I hope 2014 is moving along swimmingly for you and that you have your sights set on some goals for the year. I don’t have a product to share with you tonight but I did want to melt your heart a little with a photo. That’s Captain and his kid, Parker. I know, right? Did you let out an audible “awwwwwwww” like me? 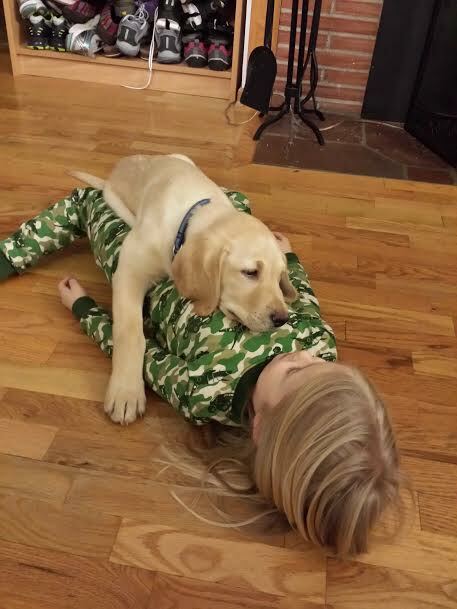 Yep, Captain recently found his home with my friend and her family and I’d say he’s fitting in just fine. Posted on January 9, 2014 by Shannon	This entry was posted in This 'N' That. Bookmark the permalink. That little girl has a life long friend! Thanks for posting that joy for all to share in. Too cute!